I love making bunting, particularly the appliqué part, so I really enjoyed doing this. In fact, I made bunting for this little man’s big sister back in July 2014. Another friend then asked to me make a sash for her friend’s hen do. She didn’t like the look of all the pink naff ones you can get online and wanted something a bit classier. She choose the fabric and I then found some coordinating fabric in my stash for the lettering. I combined bits of two online tutorials here and here, as neither worked fully for the fabric I had. Here’s how I made it, step-by-step. I took a wild guess at how much fabric I would need, and told my friend to get 1 metre. In hindsight, it may have been better to have gone for 2 metres, as I had to make the sash in two pieces. But, there would have been loads of leftover fabric if I’d opted for 2 metres just to have one single length. I cut two strips of fabric, 1 metre long by 26 cm wide. This was for a tall bride, otherwise, I may have gone a bit shorter in length. As advised in the wikiHow tutorial, I added interfacing to the fabric strips. I laid the strips right sides together and, having worked out the centre point, marked on the edge of the fabric 2.5 inches from the top, and drew a line to the centre of the fabric, on both sides as below. I then sewed along this line to create the shoulder seam. If you had just one piece of fabric, this would be easier and involve drawing just one line. I later had to adjust the angle (see below). Then I cut off the fabric above the line/seam. I don’t seem to have a picture of this, but at the hip end of the sash, I folded the sash in half, as it would be once sewn, and cut the fabric at an angle, to create a diagonal edge. By cutting through both sides of the sash at once, it ensured that both sides had exactly the same angle. Having traced my letters onto Bondaweb, ironed this onto my contrasting fabric and cut the letters out, I then ironed the letters onto the front of the sash, ready for appliquéing. Then I folded the sash, right sides together and sewed 1/2 inch from the edge all around the raw edges, leaving a gap at one end of the sash to turn it out. This time, once I turned it out, it was sitting much better on my shoulder. All that was left to do was join the hip edges of the sash together, about an inch from the bottom of the sash. I used the leftover fabric to create some matching bunting, about 7 metres long. My friend kindly sent me a photo of the bride/hen modelling her sash, it looked great! My sewing machine has now been temporarily put away whilst I get on with Easter crafts. I hosted an Easter egg hunt on Saturday for 8 toddlers and their mums (madness, I know. 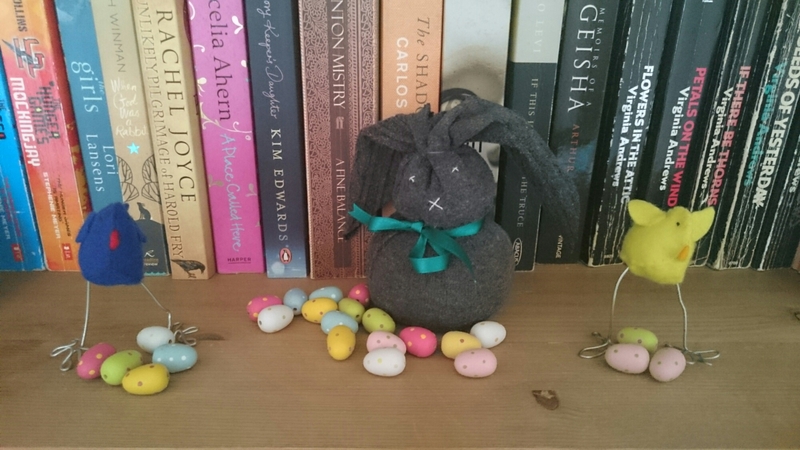 But my house actually ended up tidier than before they arrived thanks to their post-Easter egg hunt tidy-up). I whipped up this little sock bunny on Friday, who is now kept company by some felt chicks I made for last year’s Big Comic Relief Crafternoon. Next up, I’m going to attempt an Easter wreath!